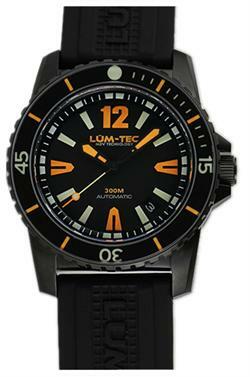 The 300M-2 is a Lum-Tec diving watch that is water resistant at a depth of 300 meters. Two stylish straps are included, including a stainless steel bracelet with a diver's extension. We are an AUTHORIZED Lum-Tec DEALER! The 300M-2 is a Lum-Tec diving watch that is water resistant at a depth of 300 meters. Two stylish straps are included, including a stainless steel bracelet with a diver's extension. 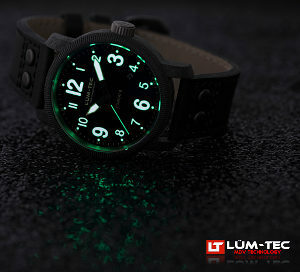 The 300M-2 utilizes some of the best watch glow technology in the market. The watch's two-tone Maximum Darkness Visibility (MDV) technology allows it to glow for more than 24 hours. Weight on rubber strap: 4.1oz / 117g. Weight on steel bracelet: 7.5oz / 214g. Titanium carbide PVD hard coating. 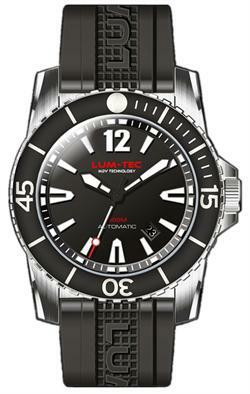 Uni-directional 60-click rotating luminous bezel with sapphire insert. 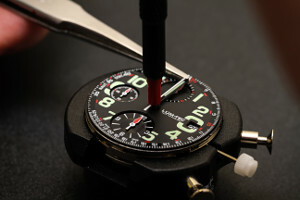 21,600 BPH Sii NH35 Japan automatic movement with hacking and handwinding features. Sapphire crystal with clear double side anti-reflective coating. Threaded solid stainless steel caseback. 300 Meters / 990 ft. water resistance. 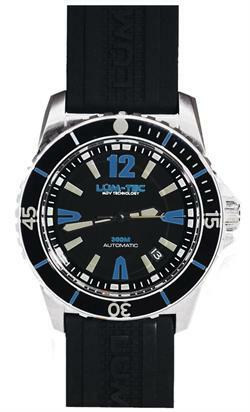 2 straps included: Stainless steel bracelet with special ratcheting diver's extension and molded rubber. 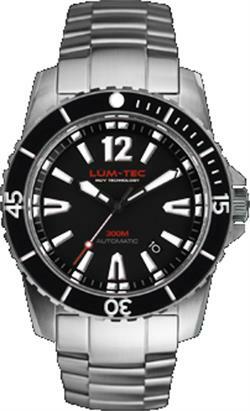 Every LÜM-TEC watch features exclusive MDV Technology™. "Our watches are designed with feedback from watch collectors around the world"
Lum-Tec writes: "Our company brings features and quality normally not thought possible without spending thousands of dollars. We are in the business of making custom and limited edition watches, creating unique designs and pioneering new luminous application technologies to apply to wristwatches." - MDV Technology® Extreme luminous hands and dials. - 316L surgical grade stainless steel or tungsten carbide. - Thick top grade sapphire crystals. - Top grade anti-reflective crystal coatings. - Top grade straps or bracelets. - Titanium carbide PVD hard coatings on some models. - Large case designs. 38mm-50mm sizes. - Exclusivity. All watches are numbered limited editions. - 100 meters/330 ft. minimum water resistance. - Full feature heavy duty movements. - Lifetime timing adjustments on mechanical models. - Lifetime battery replacement on quartz models. - One year limited warranty. - Highest grade packaging and display box set. - Design, assembling, testing, adjusting and quality control in USA.